Our Specialty. Come In and Get Some Today! Our cake pops are our biggest selling item! 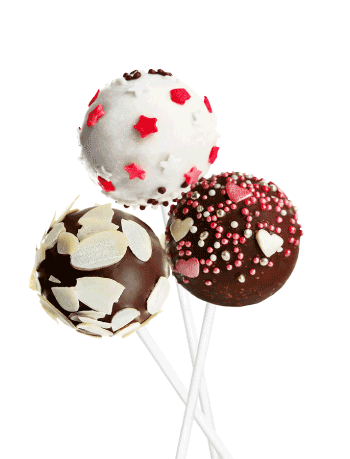 Cake pops are made with freshly baked cake, real buttercream icing, and rolled like rich truffles. We then dip them in the finest chocolate , and they remain super moist and delicious! The pops we sell in store daily change according to season. We can also make custom and designer pops to suit your occasion! Great for weddings, showers, birthdays or just because. HOW DO YOU STORE CAKE POPS? Cake pops are best if kept refrigerated . Pops can also be frozen for a shelf life of up to 3 months!